Tugging at the heartstrings: Ori opens with perhaps the most touching and ultimately heartbreaking scene I’ve ever seen in a game, and it sets the tone for the tale of error, loss, forgiveness, redemption (and more) that follows across the next ten to twelve hours. The story is delivered through a few very basic lines of text which appear at set moments, but what is being said is emphasised indefinitely by the wonderful animation of the onscreen events and characters. The saying that a picture tells a thousand words is rarely true in my opinion, but where Ori is concerned, it certainly might be. Ori‘s message is beautifully straightforward – a simple tale of good versus evil retold in a strange, rich and utterly compelling fantasy world which contains some of the most charming new characters to emerge in recent gaming history. A lot of spit and polish: I’ve hinted at how beautiful Ori is already, but it really has to be seen moving to be believed. 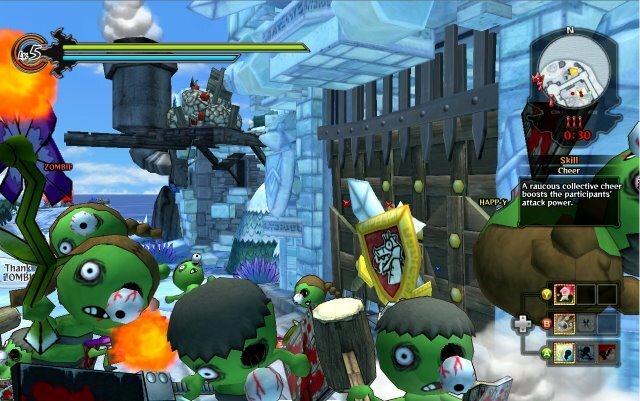 As multi-layered, animated backdrops become the norm in similar platform games, Moon Studios have focussed their attention on ensuring that the animation, lighting and foreground scenery is pixel-perfect. That’s not to say the backdrops are any less lavish – rainforests, lagoons, caves, canopies and swamps are all richly detailed. Ori (as the titular character) is perhaps one of the most delightful creature ever created in a digital medium – he scampers, hops and leaps through his deadly world like a cross between a monkey and a pixie, whilst his inquisitive nature shines as brightly as the light which emanates from his body. Enemies are equally well realised, ranging from cowardly spore-throwing tentacles and wall-slimes through to semi-humanoid spiderlings and many far more sinister creations. 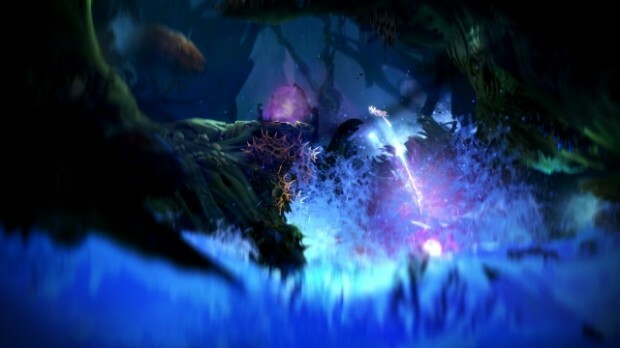 Slick and smart: At the heart of games like Ori is a smart gameplay structure which features a solid feeling of progression, a steadily rising level of challenge and perhaps (often enough at least) the increasing feeling of omnipotence. This is perhaps where Ori delivers its greatest achievement. Diminutive as he is, Ori always feels vulnerable and as his skills expand, so does his reliance upon the players dexterity in mastering the control set to keep him out of trouble. Ori is not a tank and instead of spamming hugely destructive attacks in the late game, players will still need to think carefully about every battle – often, the moveset simply facilitates significantly better ways to evade enemies altogether. 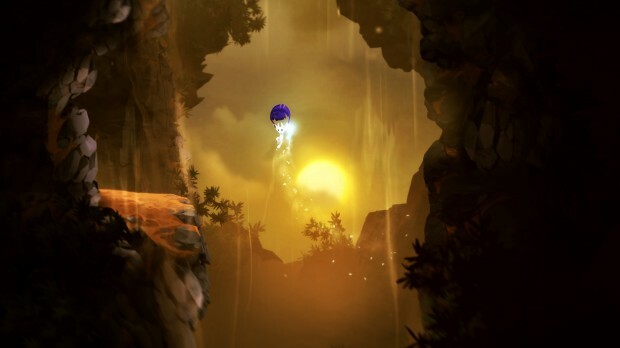 One unique addition to the gameplay in Ori is the ability to save anywhere, at the cost of one point of spirit energy and considering this energy is also used to open certain doors, managing the available reserve (which can be expanded through pickups) is a key element in determining your risk versus reward strategy. A lengthy challenge: Although Ori weighs in at around ten hours for the basic story inclusive of any mandatory backtracking, completionist players will want to spend perhaps another two to five hours poking their noses into every nook and cranny using their newly unlocked powers. Beware though that once the game is over, you’ll need to start a new game (with only the starting powers) to continue playing. Whilst backtracking is as present in Ori as it is in any Metroidvania style game, the new powers Ori gains as he moves through the game will generally enable enough shortcuts, secrets and alternative routes to keep things interesting. 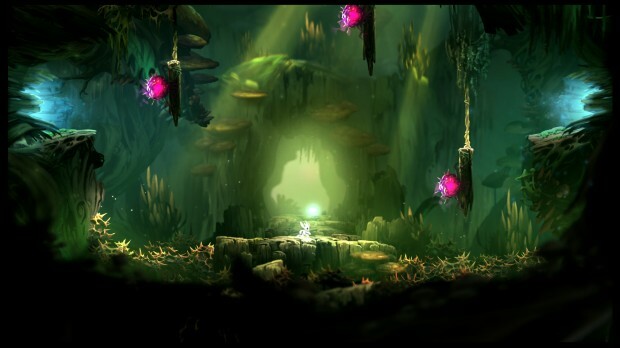 A challenge too far: Ori is, in many places, a very tough game but the ability to save anywhere (albeit at a cost) ultimately means that players of any skill level will be able to grind their way forwards up until certain points. Unfortunately though, those points come in the form of the climactic events at the end of each of Ori‘s dungeon style levels. The first of these comes relatively early in the game (around two to three hours) and takes the form of a dash upwards and out of a hollow tree which is rapidly filling with water. This event (and the others which follow later) are short sequences with no checkpoints that punish even the slightest failure with death, and demand that players demonstrate complete mastery over a recently acquired skill. Sadly, these are the kind of sequences which will cause some players to throw pads down in disgust, never to play Ori again, which is a real shame. Slightly hamfisted combat: Although the balance of abilities and progression in Ori is more or less perfect, the combat suffers a little bit by the end. Oris’ basic attack has him throwing balls of energy at enemies over a short range and although this skill can be powered up, it is weak against stronger foes and leaves Ori vulnerable to counterattack. His other skills (including an air-dash which can redirect projectiles and a slam attack) are a bit more effective, but require more controller input from the player, and it is often easier just to avoid enemies rather than risk bleeding thumbs! I think it’s clear how I feel about Ori already, but I guess if I am ever going to be asked to summarise my thoughts about this game in a single paragraph, this would be it. 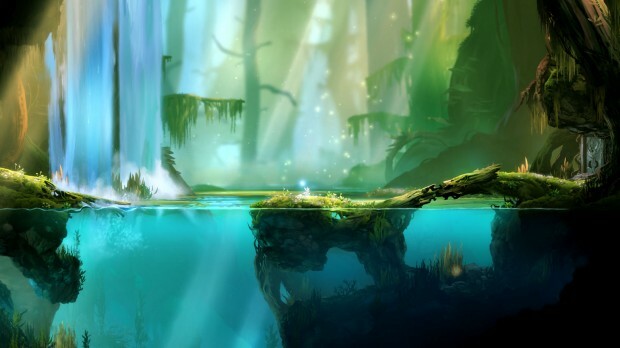 I truly believe that later this year, Ori will be competing for a place on many peoples Game of the Year listings, and it wouldn’t surprise me if it won more than just a few accolades of that calibre. Despite a few minor frame rate issues when things get busy and the slightly uneven curve in difficulty which I’ve already mentioned, this game is an absolute masterpiece. The only suitable way to describe how it looks and sounds is magnificent, whilst the level design and progression mechanics are absolutely top-drawer. The story is meaningful even though it’s delivered with only the most subtle dialogue, and as a package the only failing is that it ultimately does have to end. 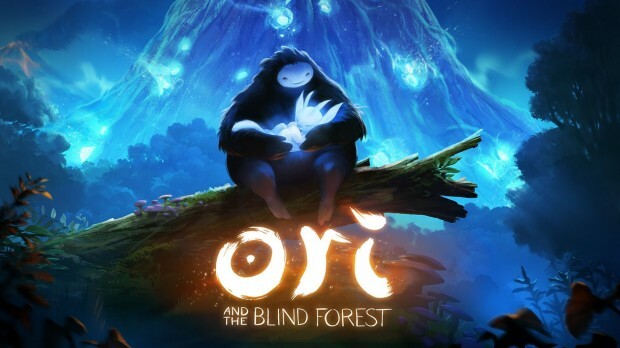 If ever there was a game that demonstrated how far digitally distributed console games have come by comparison to their retail counterparts, it is certainly Ori and the Blind Forest.